Located on a bluff overlooking the town of Salmon and the Salmon River, with an unobstructed panoramic view of the surrounding mountains, the lodge is built of spruce logs on 19 acres. 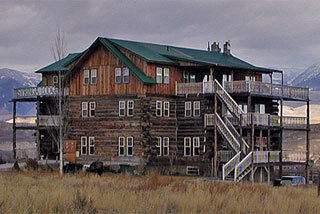 The entire lodge has recently been renovated and redecorated. Dave and Paula Tomlinson moved to Salmon from Tupelo, Mississippi in 2004 to become the new owners/hosts of the lodge. Dave is retired from the U.S. National Park Service and Paula is a former mathematics instructor at the University of Mississippi. They have added a bit of southern hospitality and charm to the lodge.